I already have a seven layer bar recipe on this blog, but this one deserves a post on its own because it’s even more homemade. 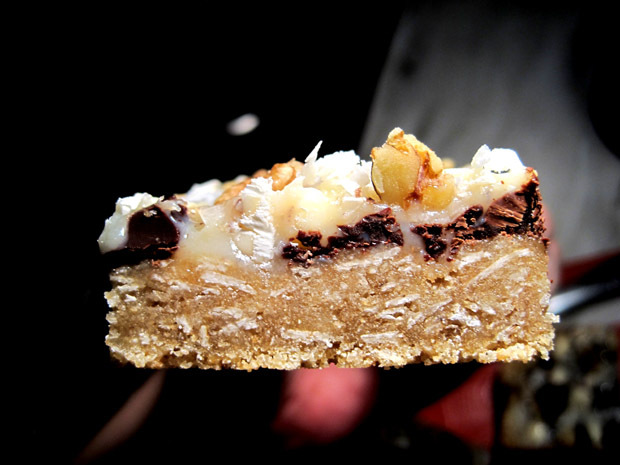 Usually seven layer bars are made with graham crackers, canned condensed milk, sweetened coconut flakes and chocolate chips. All highly processed stuff, and I’ve a great disdain for things that come out of a package. 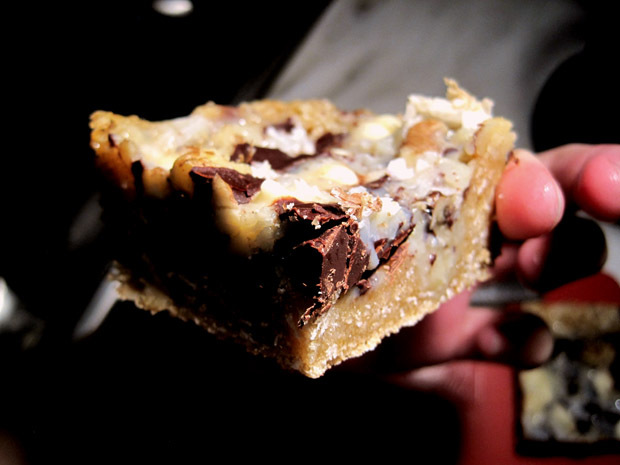 This seven layer bar takes homemade to a new level: I made the condensed milk out of milk, and the cookie base is made out of an oatmeal cookie dough. The chocolate chips were from a chopped up chocolate bar. I could up the ante by making my own sweetened coconut flakes… and mill my own flour. Hah, I could carry the homemade schtick a lot further. Honestly the only real reason why I had homemade condensed milk around was because I bought some milk to make cinnamon buns, but then I realized my yeast packets were expired and they didn’t activate. Which sucked, because I really wanted to make bread. But never mind, I used up the milk to make some condensed milk. If you wanted the condensed milk recipe, you can click here. I really don’t expect you to, though. Mine came out a little bit grainy, but then it didn’t matter in the seven layer bar. The oatmeal cookie base is quite lovely, it holds everything up well and I feel good about putting a little bit more fiber into my body. The recipe had way more cookie than I’d like, so I just made oatmeal chocolate chip cookie dough with the rest and it’s now in the freezer, ready to be baked whenever I want some homemade sugary goodness. Seven layer bars are so incredibly easy; I guesstimated all the proportions of the filling by just sprinkling it by hand. I like baking like this; I feel more at one with my food, you know? In a mixing bowl, cream butter and brown sugar. Add egg and vanilla; mix well. Combine oats, flour, baking soda and salt; add to the creamed mixture. 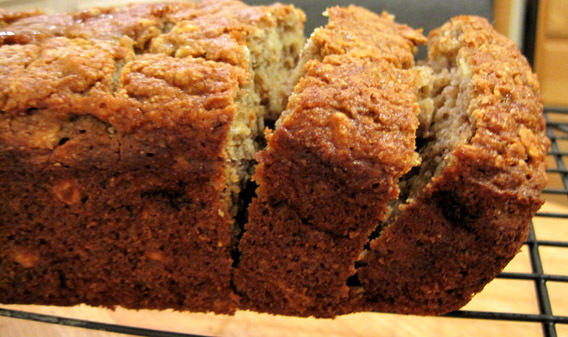 Spread in the bottom of an ungreased 9×5 baking pan with the thickness to your liking; set aside. Spread condensed milk on cookie dough base. 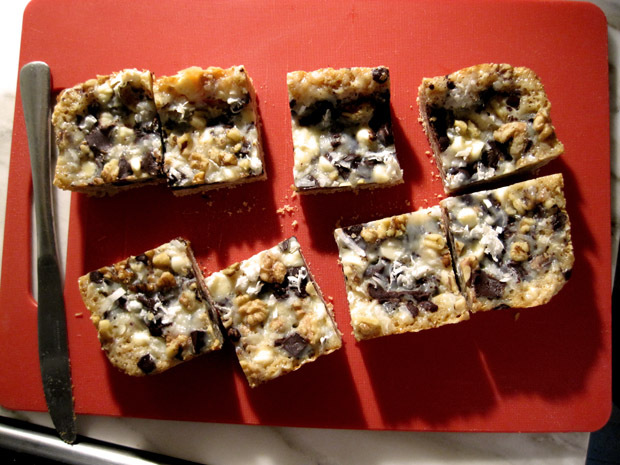 Sprinkle chocolate chips, coconut and walnuts. Bake at 350 degrees F for 20 to 25 minutes. I recommend freezing the bars before cutting into them. It’s a lot easier to handle and you get cleaner slices. 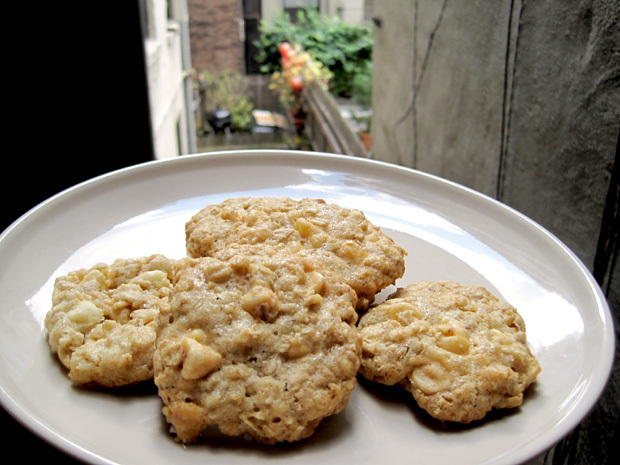 This is not the first time I made these cookies, and every single time, they turn out wonderfully. Honestly, white chocolate is probably my favorite chocolate in cookies. Sometimes, regular semi-sweet chocolate has a slight hint of bitterness that I don’t prefer in my sweet indulgence. 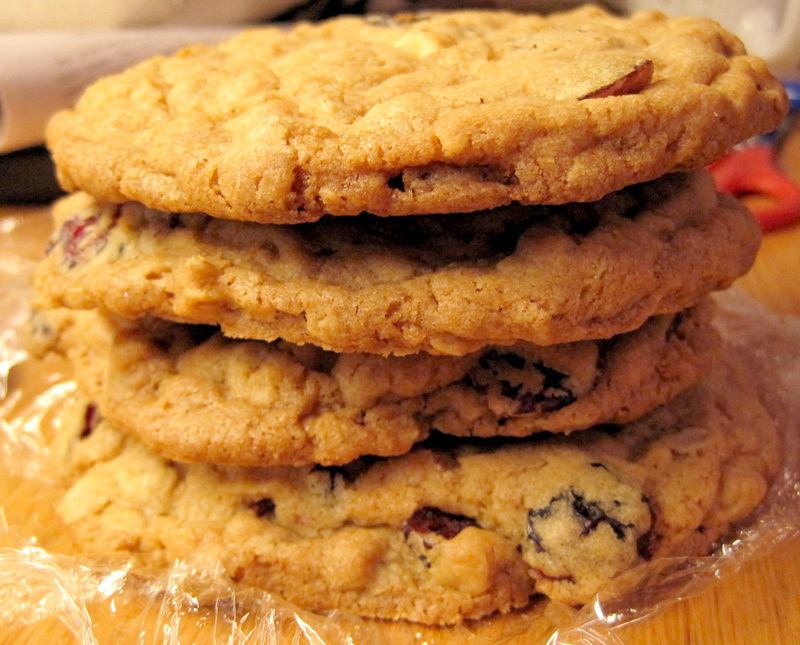 Also, I love white chocolate with cranberries in my cookies – and this is another fantastic, tried-and-true recipe. Also, I almost never have the time to bake during the day, seeing how I’m busy with work and school throughout the week and during the weekends I’m busy out and about with some errand or another. Baking for me is very much a therapeutic indulgence: something I do in the middle of the night when I am absolutely sick and tired of studying. And because of the unusual free time I had on my hands, you have a wonderful picture of my cookies basking in natural light. I stood in my pathetic excuse of a balcony to get these pictures. The original recipe called for 14 tablespoons, but I recommend reducing it by two tablespoons. Based on the original recipe, my cookies spread too much – I quelled my frustration by chewing on the admittedly delicious but ugly cookie scraps. Also, texture-wise, these are a good balance between chewy and crisp – but I’m sure if you played around with baking times you could alter these texturally. I didn’t have sea salt so I didn’t use it, but I’m sure they would only improve the cookies. 1. Preheat oven to 350 degrees. Line baking sheet with parchment paper or Silpat. Whisk flour, baking powder, baking soda, and table salt in a medium bowl. 2. Beat butter and sugars until light and fluffy. Scrape down bowl with rubber spatula, then add egg and vanilla and beat until incorporated. Scrape down bowl again. Add flour mixture gradually and mix until just incorporated and smooth. 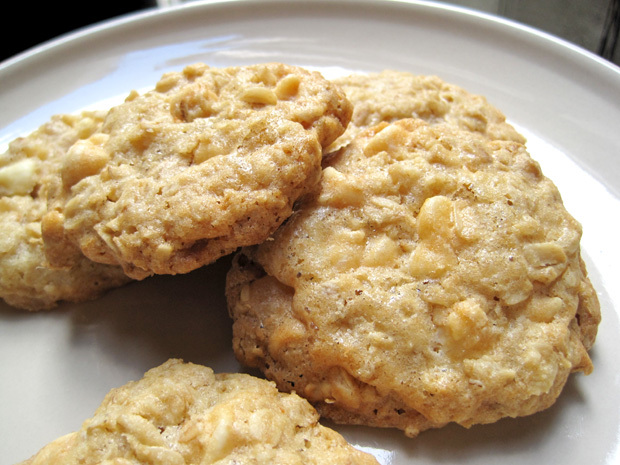 Gradually add oats and white chocolate and mix until well incorporated. 4. Sprinkle a flake or two of sea salt on each cookie. 5. Bake until cookies are deep golden brown, about 13 to 16 minutes, rotating baking sheet halfway through. Transfer baking sheet to wire rack to cool. It’s summertime, and berries are at their peak. Sweet, succulent and juicy, strawberries are a fantastic way to cool you down and satisfy your sweet tooth. I was grocery shopping, and I was lured by the strong scent of the strawberries. Nothing beats the smell of ripe strawberries; which incidentally, taste nothing like strawberry-flavored candy. Growing up, berries weren’t something I ate with any frequency because they don’t do well in tropical Singapore. I was probably quite surprised when I had my first strawberry, wincing at its tartness and its complete departure from strawberry-flavored things. 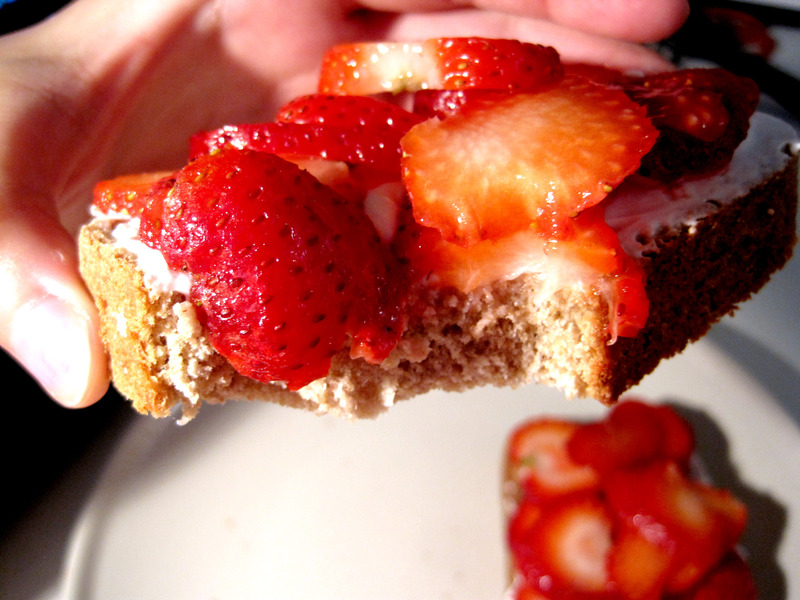 I came up with the idea for this meal by cobbling together what I had in my fridge: strawberries that needed to be eaten, a large tub of Greek yogurt, and oatnut bread that I made a couple of days ago. You could use whipped cream cheese or whipped cream on your toast, but Greek yogurt offers the same creaminess and tang with much less fat and a lot more protein. This dish is basically a healthier version of the strawberry shortcake. 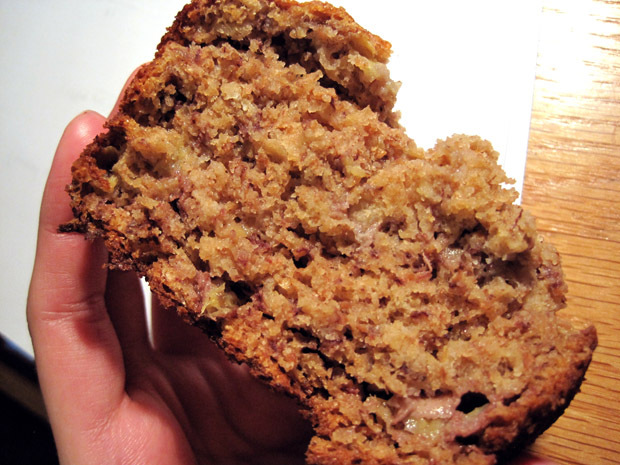 This bread was made with white whole wheat flour, oats, and walnuts. 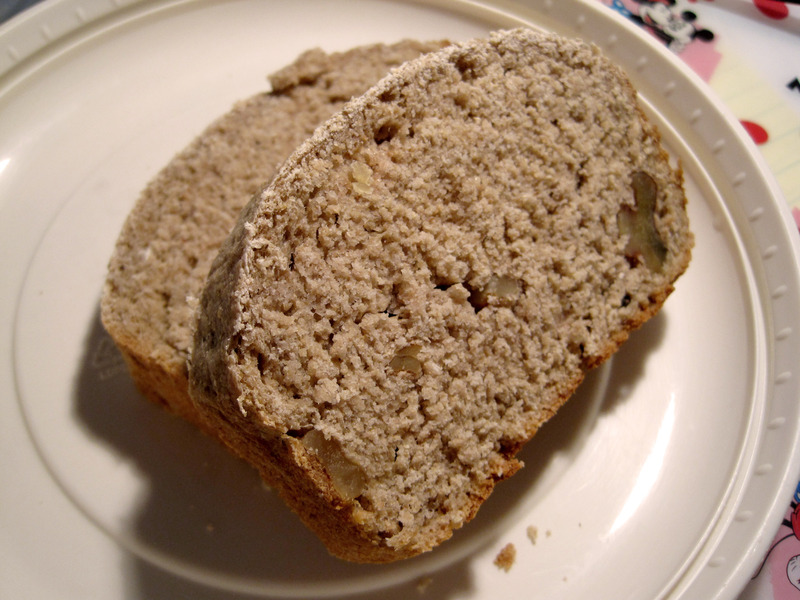 It’s a firm and hearty loaf that will stand up to spreads and drippy fillings, so it would be good for a sandwich. The original recipe called said vital wheat gluten was optional, but I didn’t have it. Whole wheat flour can be a little tricky in yeast breads, but don’t be discouraged. It might not taste or feel like the soft, fluffy prepackaged loaves you get in the supermarket, but it also doesn’t have a ton of unpronounceable additives. Toast bread, if desired. 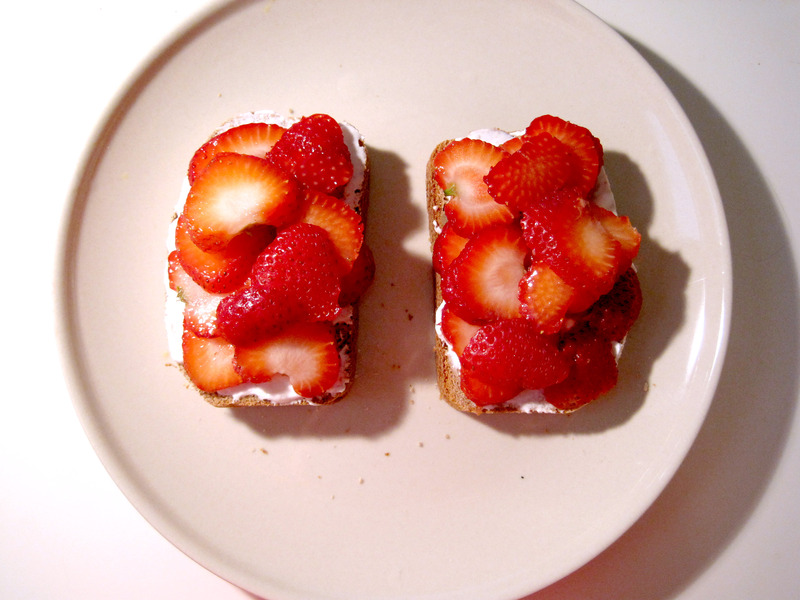 Spread Greek yogurt on bread. Layer strawberries. Eat! In a large bowl, combine the yeast (about 1/4 oz.) and 1/4 cup warm water. Stir and let stand for 5 minutes, until foamy. 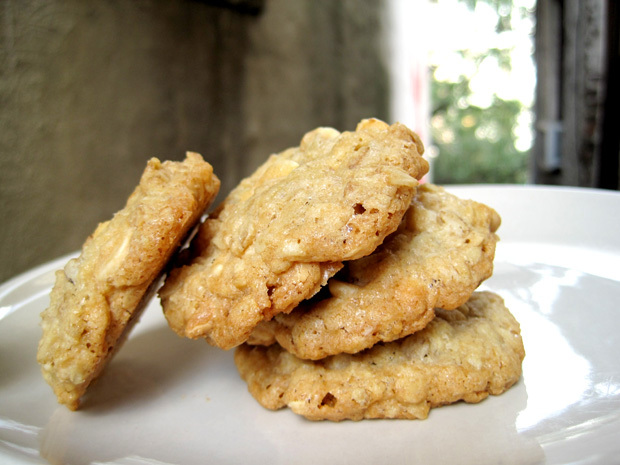 Stir in remaining water, 1 cup of flour, the oats, vital wheat gluten (if using) and honey, and mix well. Add in salt, pecans and an additional 1 1/2 – 2 cups flour. Stir, adding remaining flour gradually, until the dough comes together into a ball a begins to pull away from the sides of the bowl (this can also be done in an electric mixer with the dough hook attached). Turn dough out onto a lightly floured board and knead, adding flour a tablespoon at a time as necessary to prevent sticking, until dough is smooth and elastic, about 5-8 minutes. Place dough in a lightly greased bowl, cover with plastic wrap and let rise until doubled in size, about 1 – 1 1/2 hours. Lightly grease a 9×5-inch loaf pan. After dough has risen, turn dough out onto a lightly floured surface again. Gently deflate dough into a rectangular shape. Fold up the two long sides of the rectangle and pinch the seam together. Place seam-side down into prepared loaf pan. Again cover the bread with a piece of plastic wrap and let rise until almost doubled in size, about 45 minutes. While the bread is going through its final rise, preheat oven to 375F. Bake loaf for 35 minutes, until an instant-read thermometer inserted into the bottom reads about 200F. Cool loaf outside of pan on a wire rack completely before slicing. Notes: I ended up using about 2.5 cups of flour total. Despite this being called a dessert blog, I don’t make dessert all the time. I might want dessert all the time, but I simply don’t have enough calories allotted to eat everything I want. So, I improvise. I fulfill my desire to create by adding a chock-full of healthy ingredients into what could otherwise be dessert masquerading as healthy food. This, is actually good for you. 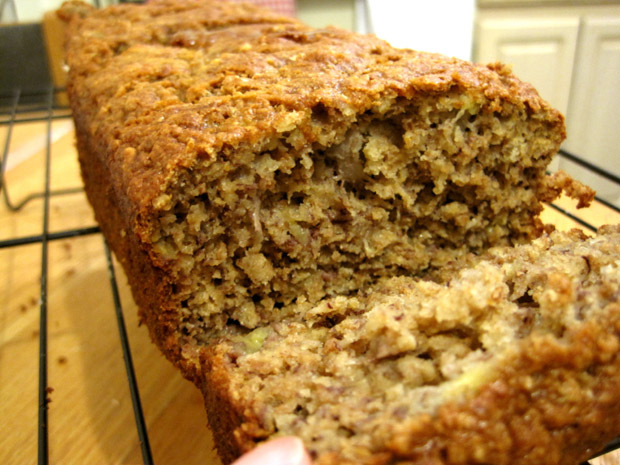 Bananas, bran, oatmeal and walnuts. No better way to put your digestive system to work. Of course, the downside to using no fat and less sugar is that you get something that tastes like health food. I probably tweaked the recipe a little too much, but I’m going to reproduce the original so you know what to do. Preheat oven to 325 degrees F (165 degrees C). Spray a bread pan with non-stick cooking spray, and lightly dust with flour. In a large bowl, beat eggs and sugar in a large bowl until light and fluffy, about 5 minutes. Beat in bananas, applesauce, milk, oil and vanilla. In a separate bowl, sift together flour, baking powder, baking soda and salt. Stir flour mixture into banana mixture, mixing just until blended. Fold in walnuts. Pour batter into prepared pan. Bake in preheated pan until golden and a toothpick inserted into center of the loaf comes out clean, about 1 hour. Turn bread out onto a wire rack and let cool. I don’t usually keep butterscotch chips around the house, but I bought some for the Seven Layer Magic Cookie Bars I made and figured to put the rest of it to good use. 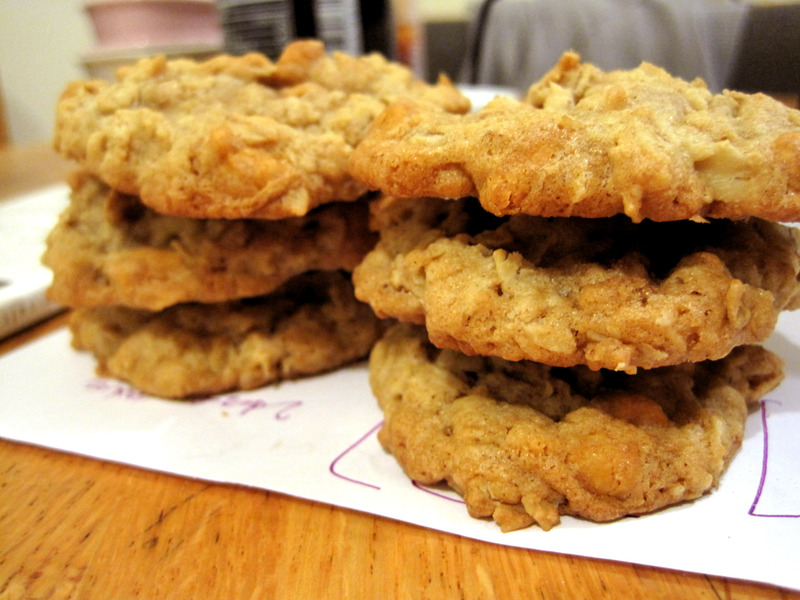 And since I had a hankering for something vaguely wholesome, I thought oatmeal would be a good ingredient to incorporate, and viola, the Oatmeal Butterscotch Cookie was born. Well, borne out of extensive research from my favorite baking blogs anyway. Apparently, this recipe was Cindy McCain’s in the cookie stand-off that Good Housekeeping usually hosts for potential first ladies. This was an excellent cookie. 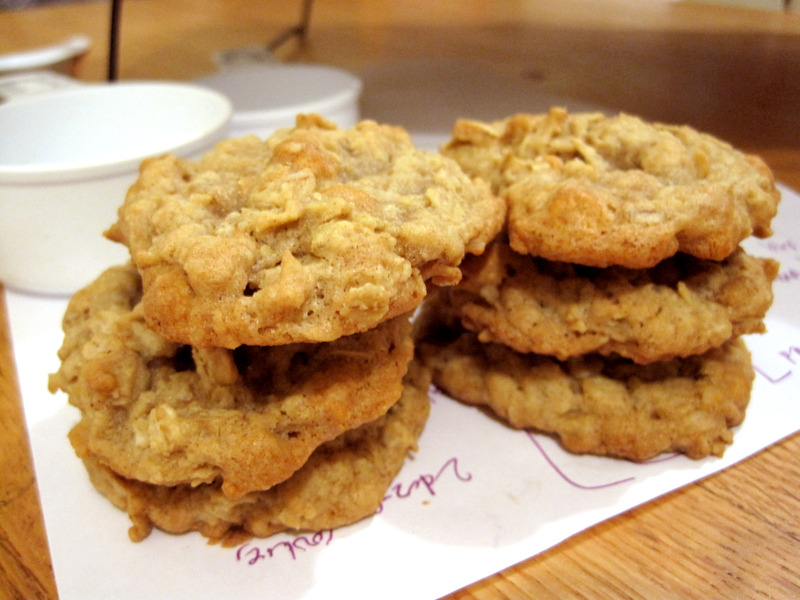 It wasn’t very sweet, which I liked, and the good amount of rolled oats really gave it a nice chewiness with the occasional toasted oat texture. I might have added a little bit more salt than required but I thought it gave the cookie a nice savory note. The butterscotch chips are perhaps not my favorite chip but overall it really gave the cookie a wholesome, mapley flavor. I halved the original recipe and it still turned out excellent. Preheat oven to 375F. Line a baking pan with parchment paper. In a large bowl, cream together butter and sugars. Blend in eggs and vanilla until mixture is smooth. In a medium bowl, whisk together flour, baking soda, cinnamon and salt. 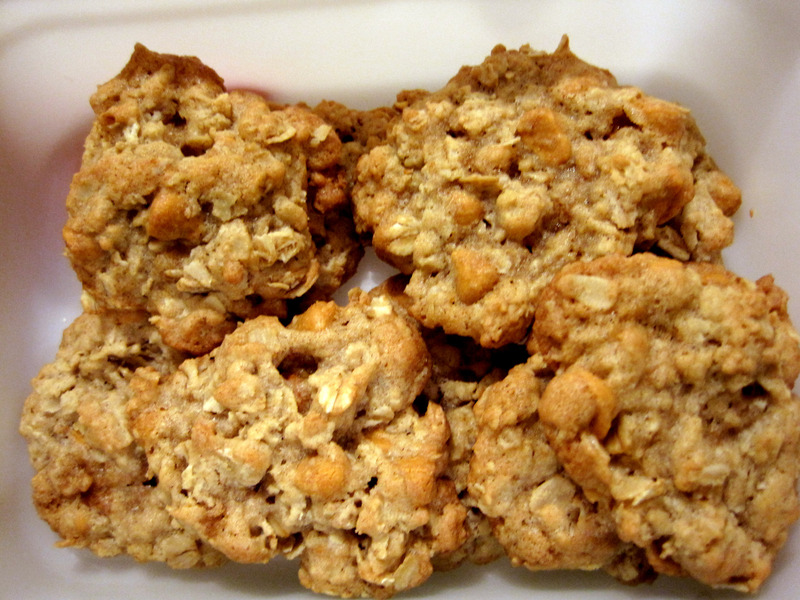 Stir into butter mixture, then mix in the oats and butterscotch chips. 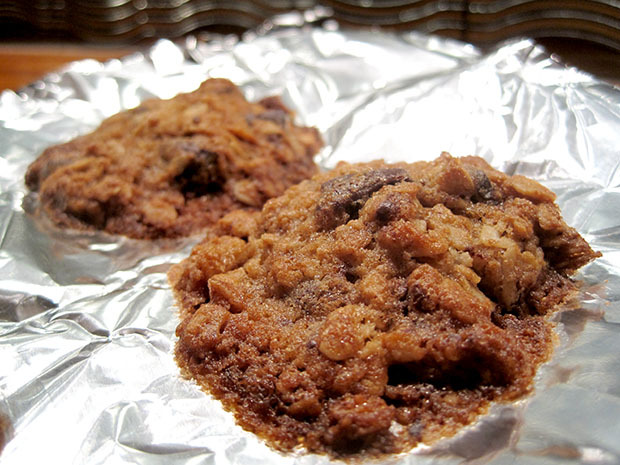 Drop rounded tablespoonfuls (large balls) of cookie down onto the prepared baking sheets, leaving about 2 inches between each cookie to allow for spread. Bake for 10-11 minutes, until the edges begin to brown. Let cookies cool on the baking sheet for about 5 minutes, then transfer to a wire rack to cool completely before storing in an airtight container.